What is producer surplus, and how to calculate it. - FreeEconHelp.com, Learning Economics... Solved! Home microeconomics surplus What is producer surplus, and how to calculate it. What is producer surplus, and how to calculate it. 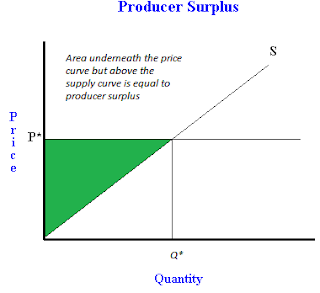 Producer surplus is when a producer essentially makes profit off of a good or service they are selling. When you are drawing the supply curve, it represents the price the firm is willing to sell a good or service for at all of the different possible quantities. However, when equilibrium price is found, the firm gets to sell all of his goods or services at that equilibrium price, instead of the other prices he was willing to sell for at other quantities. Most of the time, the supply curve will intersect the price and quantity axis at the origin (0,0). This means that calculating producer surplus is somewhat easier than calculating consumer surplus because less math is involved. In order find producer surplus we need to calculate the area of a triangle, remember that the area of a triangle is ½(base * height). The area we are focused on for producer surplus is the area below the price, but above the supply curve. This is because the firm receives the equilibrium price for all of the goods and services sold, but is willing to sell them for the amount equal to the point on the supply curve. Because there is a difference between the amount they are willing to sell for, and the amount they actually receive, they get a surplus. So in order to get producer surplus, we need to multiply ½(base *height). The base of the triangle will be Q*, because Q* units are being sold. The height of the triangle is P*, because the goods are being sold at a price of P*. So the final equation will be ½(base*height). Let’s say for example that Q* is 5, and P* is 5. Then producer surplus would be 1/2(5*5) or ½(25) which is 12.5. So producer surplus would be 25.
how would you solve this same type of question to find producer surplus if this market was perfectly competitive and P=MC so our supply curve is equal to our marginal cost equation (and MC is constant so a vertical line)?